School: Central School, Lockhart St. 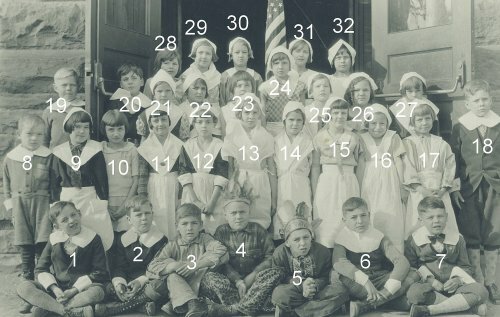 This photo is of the Third Grade Class at Central School on Lockhart Street in Sayre, PA. I understand the school is no longer there. It is dated November 23, 1932. I have also attached a high resolution scan of the logo at the lower right corner of the card on which this is mounted. It is difficult to read, but says Teed, Sayre, PA. When I noticed you had Luverne Teed in your list of photographers, I wanted to send you this photo. 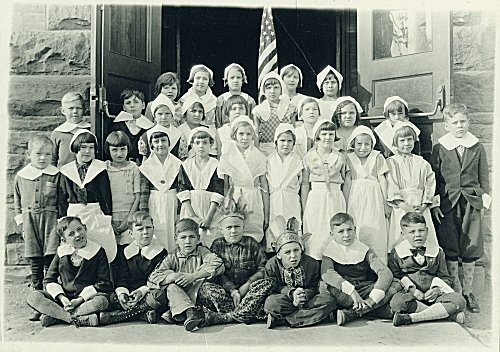 Leah Rae Hulslander, b. August 30, 1924, is standing second from the left in the top row. She is the daughter of Milford James Hulslander, b. May 3, 1903 d. April 17, 1999 and Bernice Leah Merrill Hulslander, b. March 2, 1903 d. December 15, 1933. Milford and Bernice Leah are buried in Tioga Point Cemetery, Athens, PA. I thought maybe it would help someone find a relative.